NFL hunk Tom Brady is setting up house in Los Angeles -- and dropping serious dough for a mansion he will likely share with supermodel girlfriend Gisele Bündchen. According to TMZ, Tom just closed a deal to buy a plot of land in Brentwood, just down the street from Governator Schwarzenegger -- for a whopping $11 million. And there's no house on it! A Brady source says the footballer purchased the property is to be closer to his tyke -- but a pal of baby mama Bridget Moynahan denies those claims. 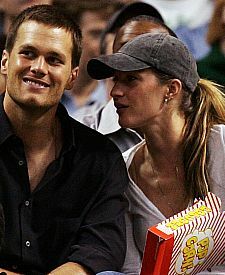 The 3-acre property was bought under the name TGBE -- with the G presumed to represent Gisele!